ROUND REVIEW 6: A dark day for Spanish-born coaches in EHF EURO 2018 Qualification ends with a close Macedonian defeat in Reykjavik. Four teams with four points each after four rounds of EHF EURO 2018 qualification in Group 4: There are no more ‘fours’ possible in this competition. 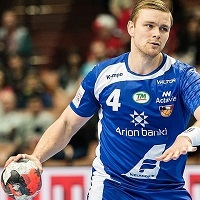 Thanks to a close 30:29 victory against FYR Macedonia, Iceland levelled the open group prior to the last two rounds of qualification on Sunday night. The defeat was the final setback for Spanish-born coaches on Sunday: Prior to Iceland’s win, Talant Dujshebaev had resigned as coach of the Poland national team after their draw against Belarus, while Xavi Pascual (with Romania) and Javier Sabate (with Hungary) lost their respective matches. New FYR Macedonia head coach Raul Gonzalez was no more successful than his country fellows in the last match of the round. It could have been an easy-going night, but the match turned out to be a thriller – with a happy end for Iceland. After being constantly ahead in the second half, the Vikings emerged victorious following their two defeats at Ukraine and FYR Macedonia in previous rounds. After scoring 11 goals in the first leg on Thursday, Macedonian goal machine Kiril Lazarov netted eight times – thereby recording an impressive average of 10 goals per EURO 2018 Qualification match so far. But even those eight strikes were not enough this time, as Olafur Gudmundsson left his footprints on the other side of the game, with seven goals. After the Macedonians had the better start (9:6), Iceland – backed by the fans and several counter attack goals – levelled the score for the first time at 10:10 and then took several two-goal advantages. After the 16:16 half-time score, the hosts did not let go of the lead, but had to work extremely hard to leave the powerful Balkan side behind. Despite some great saves and even two goals from goalkeeper Björgvin Gustavsson, they could not cast off their opponents. Everything seemed to be said and done when Gustavsson scored his second goal for the first four-goal advantage at 28:24 when there were eight minutes to play, then again when Aron Palmarsson took Iceland to 30:27 three minutes before the final buzzer. The Macedonians tried hard to gain at least a point: First Goce Georgievski netted, then Lazarov 30 seconds before the end. But after a time-out, Iceland managed to carry the win over the finishing line.